As much as my progression through graduate school has been divided into distinct stages, being in the same environment, with the same people, and performing similar kinds of work over a long period of time made it all a little too routine. It was no surprise, then, that I jumped at the opportunity to serve as a PhD summer research intern at UCHRI rather than teach another summer session. Bursting out of the bubble of graduate school was admittedly a source of anxiety, particularly because I was leaving the clearly defined structure of my English PhD program. Insecurities that I learned to quell as a graduate student resurfaced when I entered an unfamiliar workplace, and found myself questioning whether I had what it took to succeed outside of the classroom, and whether I could be a productive member of the UCHRI community. Fortunately for me, I couldn’t have asked for more welcoming and supportive people to call my colleagues. I owe an immense amount of gratitude to Kelly, Anna, Nicole, Arielle, Suedine, David, James, Ahn, and many others. It took only a couple days as an intern to dispel my fears and to realize that I had been a little too hasty to underestimate the skill base that I am cultivating as a PhD student. For several years now my conception of what an accomplishment looks like has been governed by a teleological force that reduces everything to a checklist: qualification exams, presenting papers, obtaining fellowships, publication, etc. Forcing myself to abandon that mindset, even temporarily, reminded me that my scholarly and professional development can’t be fully captured by any list. By using my academic training and skills in new contexts and engaging in new practices I gained a greater appreciation for how my humanistic training has prepared me for different kinds of work. During a typical day I would balance several ongoing projects, most of which crystallized around program development, evaluation, and administration. Reviewing existing calls for funding and developing final report guidelines gave me a glimpse of how funding works in a system-wide research institution, and offered me insight as to what makes for an effective and appealing grant proposal. My participation in the ongoing UCHRI Humanists@work initiative allowed me to think about how you determine the needs of different groups, acquire the resources and connections that will allow you to address these needs, and frame new ideas or concepts so they speak to a variety of audiences. Although one of the limitations of internships is their often short duration, in my case eight weeks, I was fortunate enough to not only participate in ongoing projects but also on a brand new UCHRI alumni tracking project which originated from a MLA Connected Academics initiative that seeks to increase the visibility of alternative academic careers. In the initial stages of a multi-campus initiative such as this, you have to create a plan that has, on one hand, enough structure to be sustained over several years, while on the other hand, enough flexibility that the program can accommodate unforeseen developments and potentially grow. I couldn’t help but register the parallels between the thought processes behind program development and the analysis required by my own research: both demand that you negotiate between larger, abstract structures and frameworks, and more concrete details. In the case of the tracking initiative we had to achieve a balance between outcomes like culture change and objectives like hard data. I was pleasantly surprised by the realization that I really enjoyed a work environment that wasn’t strictly academic. I may be used to the unstructured and informal nature of grad school, but I enjoyed the regimentation of a nine to five workday, and appreciated that the concept of the weekend still exists for many people. The heavily collaborative work environment was one of the greatest challenges: there are different modes of collaboration and you have to work around the fact that every individual has a particular style (of which, you may not particularly like). I may have adapted to the isolating nature of individual research, but being in a collaborative environment affirmed my belief that I am most productive when I find a balance of the two forms of work. There is a lot of pressure to professionalize while in grad school, but finding opportunities to do so can be difficult. While at UCHRI I worked on such areas as interviewing (a major weak point for me), networking, and thinking through an individual development plan that allowed me to strategize how I could continue my professionalization as a graduate student. I confess that before my time at UCHRI I tended to view professionalization as a process that would result in additional bullet points on a resume, such as things that could be accomplished in the span of a workshop. 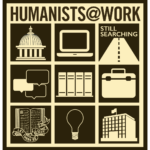 Performing new kinds of work outside of the usual academic contexts helped me realize that my professional development actually involves a great deal of reflection and introspection about how advanced humanistic study has furthered my career plans. I haven’t come to any conclusions about this, and I imagine it is a process that isn’t meant to be concluded. This blog post may make it seem like I left UCHRI completely confident and self-assured, but it wasn’t as simple as that. Yes, this internship broadened the conversations that I was participating in (or even just aware of), and I felt empowered by the gained knowledge. The flipside to this, however, was that I was overwhelmed by the vastness of the issues that we dealt with—the future of the humanities in higher education, the value of advanced humanistic study, the debate surrounding alternative and non-academic work, career paths for humanists—all of which forced me to ask some uncomfortable but necessary questions, many of which will never be answered. This blog post is the first of what will be many failed attempts to process this internship, but this is usually the mark of a meaningful experience. If I had taught summer session again I would have been able to submit final grades and walk away. That kind of closure can be very satisfying, but I like the fact that this ending feels more like a beginning.